Aviation Updates Philippines - Two Boeing planes parked at the Ninoy Aquino International Airport Terminal 1 were damaged due to the heavy rain and strong wind brought by Typhoon Glenda on Wednesday morning. "This is the first time I encountered an incident like this in my more than 15 years of service at the airport," Dante Basanta, Airport Manager of NAIA Terminal 1 told the Philippine Daily Inquirer. The strong winds damaged a Singapore Airlines Boeing 777-200 and Malaysian Airlines Boeing 737-800. 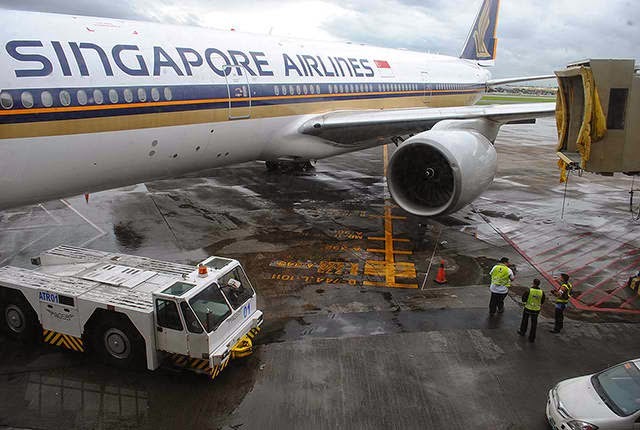 The Singapore Airlines Boeing 777-200 damaged its left wing and engine frame after hitting a jet bridge at the Ninoy Aquino International Airport. According to Basanta, no one was on board the plane when the incident happened. Meanwhile, a Boeing 737-800 of Malaysia Airlines also received damage on its front right fuselage upon hitting a mobile service stairs after it was dragged and spun 45 degrees by strong winds. "Due to very strong winds, we have 2 plane incidents. First involving an aircraft of Singapore Airlines on the ground damaging its left wing after it hit one of the air bridges of Terminal 1. Another is Malaysian Airlines plane which fuselage was damaged after it turned some 45 degrees to its side hitting a service stairs stationed nearby while it was parked at remote parking of the cargo terminal," said airport general manager Jose Angel Honrado. "Both happened in the morning. It was somehow rare. I can imagine how heavy an aircraft is and the two were moved by the typhoon winds," Basanta said. Airlines, during typhoons or severe storms, should have kept their aircraft inside a hangar or in remote parking bays. According to the Civil Aviation Authority of the Philippines, that they already sent investigators in the scene to assess the damage of both Singaporean and Malaysian aircraft. Before these aircraft will be allowed to fly, the aircraft must be repaired properly. Meanwhile, all the managers of the four Ninoy Aquino International Airport terminals on Wednesday were ordered by the head of the Manila International Airport Authority to conduct an inspection of the extent of damage caused by the Typhoon Glenda/Rammasun. Because the typhoon was too strong, it forced the authorities of NAIA to shut down its runways and temporarily paralyzing airport operations for four hours on Wednesday. The Civil Aviation Authority of the Philippines reopened the runways at 10:40 a.m., giving clearance to all airlines to take off and land. At 11:13 a.m. on Wednesday, an EVA Air plane made the first landing when the weather had cleared up. "A cursory assessment must be made so that corrective action can be instituted right away to ensure unhampered operations once flights resume," Honrado said. According to the Manila International Airport Authority, strong winds broke glass panels and fixtures and caused the collapse of scaffolding being used at the NAIA Terminal 1. Boarding bridges 101 to 106 in NAIA T3 also suffered a slight damage.